When a new camera card or hard drive is connected for the first time a panel will popup allowing mounting as a unlocked or locked source. With camera cards keeping then locked will prevent anything being written to them. With a hard drive add them unlocked as this will allow YoYotta to write the index metadata back to the directory making it quicker to index another time. Click Ignore if you want to use it as a destination or the drive is not related to the project. This preference will be remembered. Here the drive was mounted read-only to protect the contents. When finished click the eject button to unmount or the - button to leave the drive mounted. Click the lock to toggle the write protect. 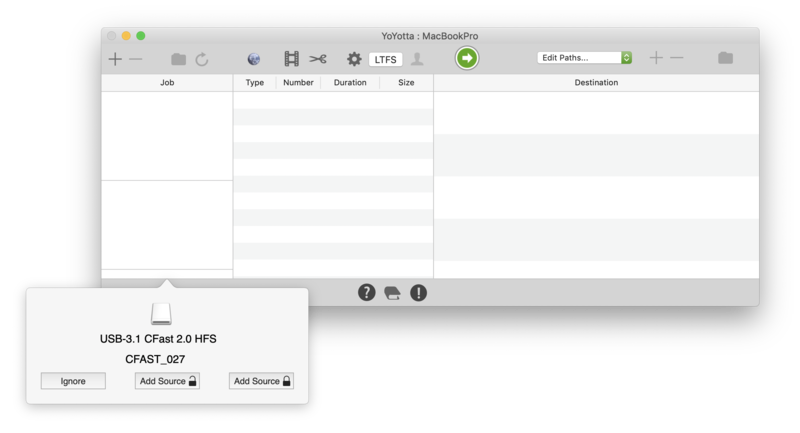 The Finder eject will not work whilst the drive is in the YoYotta job table. Click - and then the Finder eject will work. 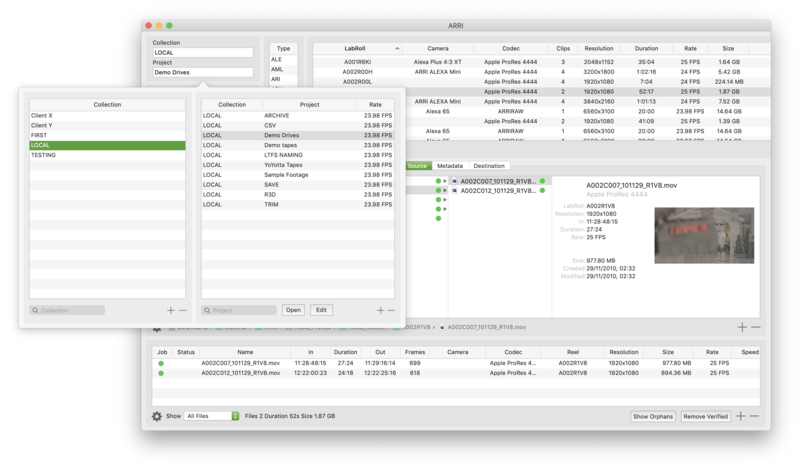 A list of connected drives is shown, select one and click Add Selected or Choose Other... to open a dialog. Clicking the lock will enable or disable writing to the drive. Do this if you want to use the drive as a destination. The drive interface is shown, which is useful to check that the drive type has been detected correctly. Occasionally macOS detects USB-3 drives as USB-2 and this means they will load very slowly.. Here it's a USB 3.1 interface. Drag in a folder from the Finder. It is not possible to drag files, however in the Source Browser it's easy to select a few files for transfer. When dragging another folder drop it above or below the existing source. Here there are two jobs which can be archived to independent destinations. Each job can be assigned to a different project using the Source Browser. 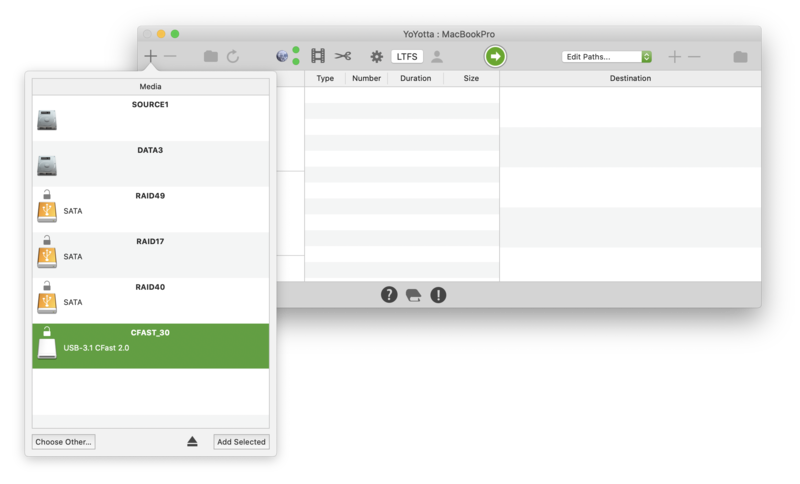 Drag folders into an existing source to create a single job from multiple sources. This is useful when there are related files to archive from different locations. Or you may want to just select some folders from a source. There will be one report showing all the source files. To see what files will be copied, click the Folder button above the Job table to open the Source Browser. By default every file will be included in the job and will have a green marker in the browser and also a green status in the file table. Files and folders can be removed or added to the job. For example to remove every file from the job, ensure the base folder is selected in the Media browser and then click the - button at the right of the Media browser. The green dots will disappear next to every file and folder. Now select some files in the browser of file table and click + to include them. When finished click Update Job before starting. Projects are grouped together in Collections. Select a Collection, then select and open an existing project. Select an existing Collection or create a new Collection by clicking + and entering a Collection name. Then click + to create a new Project. Enter the new project name. If working with camera footage select the usual frame rate and click OK. YoYotta uses the frame rate to flag off speed shots, but it's not critical to set this.